Included with these scholarly papers are all the international agreements that make up the Antarctic Treaty System along with the Measures, Decisions and Resolutions of the Twenty-Ninth Consultative Party Meeting and the Edinburgh Declaration supporting the scientific research of the forthcoming International Polar Year starting in March 2007. 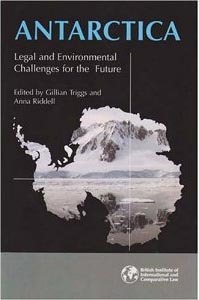 The collection provides an accessible analysis of the legal and environmental issues for Antarctica in the first decade of the 21st century for government officials and advisors, scholars, students, legal practitioners and scientists. "Antarctica: Legal & Environmental Challenges for the Future"